Taking care of your skin is important. For both men and women, your skin has a lot of work to do. It protects you against germs that would get into your body and make you ill. Your skin helps maintain your body’s temperature, too. When you get too hot, your skin allows you to perspire and cools you down. It carries messages to your brain whenever you touch something to protect you if it’s too hot. Time takes a toll on this hard working organ unless you take steps to keep your skin in good shape. What happens is that as you get older, your skin begins to sag. You’ll start to notice fine lines around your mouth and eyes as early as in your twenties. This is because as you grow older, the elasticity in your skin changes from collagen loss. That’s why you should look for products that fight aging. You want to keep your skin healthy and firm. You can get creams, lotions, or anti-aging gels that can slow the havoc that the passing years will do to your skin. Look for products that regenerate your skin while minimizing wrinkles. Many of these products are serums that will hydrate your skin and blot out blotches while giving your skin that younger, healthy glow. When you’re shopping for these products, look for anti-aging eye creams and don’t forget anti-aging products for your lips as well. Aging shows up on your lips in the form of flakes, dryness, wrinkles or a combination of the three. There are products that you can buy to keep your lips looking smooth and soft that are more powerful than an ordinary lip balm. You can also find some with built-in SPF to protect your lips from the sun’s harmful rays. You don’t want to wait until you’re older and damage has shown up before you start taking care of your skin. Right now, whatever age you are, you want to follow a beauty routine for your skin. Start by making sure that you don’t accidentally age your skin before its time. This can happen if you are out in the sun and don’t use an appropriate sun block. 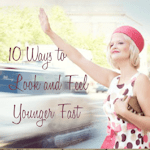 The sun can age your skin and give it a wrinkled, leathery appearance when you’re older. Keep your skin clean by using facial cleansers and don’t forget to exfoliate. Sometimes men will avoid certain skin care routines because they just don’t think about it. But your skin matters and women do notice a man with great looking skin. Everyone gets blemishes on their face once in a while. Some people are more prone to skin problems than others, but that doesn’t mean that there’s no hope for fixing the issues. There are products that are just right for any type of skin that can clear problems right up. One thing you may not realize is that when you shampoo and condition your hair, there is often a faint residue left on your skin. You won’t see it – and you may not even feel it – but your skin does. And what happens is this residue stays on your face and goes to work clogging up your pores. When that happens, you end up with blemishes or dry, irritated looking skin. That’s why it’s important to use a facial cleanser that will clear your pores and remove any acne spots. Even if you don’t have problems with your skin, you should use a daily moisturizer. If you’re a man, you may wonder why you should moisturize. The answer is for the same reason that a woman should. Because moisturizing protects your skin against the bad effects of weather changes – both from cold and humid weather. It hydrates your skin and it promotes new skin growth. If you’ve noticed moisturizers before, you’ll see that there are plenty of them available both offline and online. But which moisturizer to buy depends on what’s in the product. There are a couple of ingredients that you want to pay attention to in a moisturizer. The first ingredient is glycerin. This is what will help keep your skin hydrated. The next ingredient that you want to look for in a moisturizer is antioxidants. These gems fight aging in the skin. Proper skin care means you adhere to a regimen of nurturing and protecting the skin that you’re in – regardless of age or gender. These skin care basics will help you look your best as you move through your life. Having a regular routine for caring for your skin is as important as brushing your teeth and eating well. Taking care of your skin is important! These things all work together to create a happier, healthier you! A compilation of ten articles on Sun Damage and Skin Cancer.